A well-ordered Endcap display of theater-pack and family-size boxed candy is surrounded by a corral of Wire Fencing. 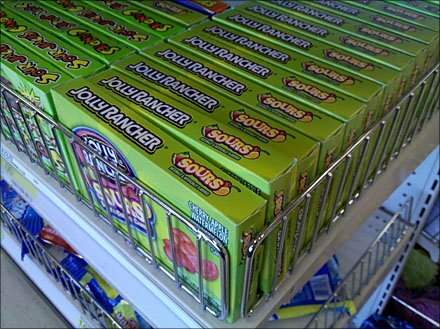 The Fencing could also contain and display bagged candy with equal ease. The open wire Fenced fronts and sides allow color and some of the branding to peek through. Jolly Rancher is far more jolly in color than obscured.